DIY Bangle had a booth at CHA - I had recently seen these bangles on Robin's Blog - so I was thrilled to be able to take one home to alter....I used my Cut N Dry pad and rubbed on Watermelon Adirondack Pigment Ink, and let it dry. Then I stamped my images (from Innovative Stamp Creations) in Pitch Black Adirondack Pigment Ink and let dry. 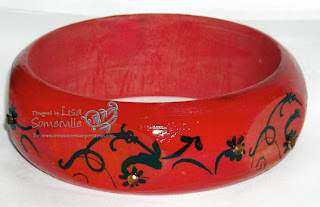 You then need to seal your bangle, so the ink won't wash off when wet. I applied a thin coat of Glossy Accents, but you could use Krylon Fixative or any type of varnish spray. Once dry, I glued on my rhinestone bling from Kaiser. wow that's nifty!! love the colors you choose, very pretty! This is gorgeous!! I can't believe you already made this:) Thanks for the instructions LOL! I love the colors.